​This production is presented in association with Joseph Chamberlain 6th Form College. ​£5.00 ticket for workshop plus show. 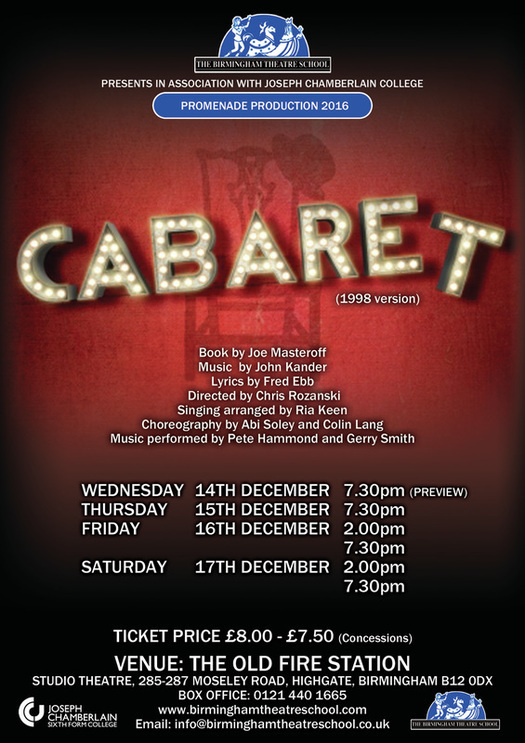 Birmingham Theatre School in Association with Joseph Chamberlain College will be hosting a Workshop and Performance Day of Cabaret( 1998 Version) and you are formally invited to attend. Experience for yourself the excitement and enthusiasm shared by all as we celebrate The Professional Acting Diploma Course Graduation Show 2016. With a large ensemble company of actors from The Btec level 2 and Level 3 in performing Arts , it’s an experience not to be missed. This year’s Promenade show will be staged at the schools permanent home. The Old Fire Station 285-287 Moseley Rd Highgate. This facility houses both our rehearsal and performance venue. . This performance promises to be a memorable musical experience. So why not join us for this unique day, participate in a practical workshop exploring both text and characterisation as well as meeting members of the company. We look forward to meeting you.